Co-founders Jane and David Kelly undertook their first rescue in November, 2012 and their efforts have since grown into the robust organization, Oregon Horse Rescue. Oregon Horse Rescue was started by Jane and David Kelly; our first horse, a Percheron named Katie Sue (pictured below) was rescued in November of 2012. Since then, we have assisted more than 100 at-risk horses through our programs that offer rehabilitation, re-homing and adoption, and sanctuary to horses in need. OHR takes in horses that have come from a variety of sources – surrender by owner, auction yard, neglect cases, and referrals from Lane County Animal Services, veterinarians, or other rescue operations. Our primary focus has been on horses needing a home who are elderly or advanced age, disabled, blind, and/or injured (or all of the above). Our facility is not breed-specific and we don’t just pick the pretty, adoptable horses to help. We believe that no animal deserves to suffer; our interventions help horses that would likely otherwise be euthanized or sold into slaughter. Many of these horses will live out their lives on our property as long-term sanctuary residents. Others, who are younger and able-bodied, will be rehabilitated and ultimately find their second careers through adoption into responsible, compassionate, and approved homes. The sanctuary property is 70 gently sloping acres west of Eugene, Oregon. It is subdivided into a number of pastures to allow compatible horses to be placed together in small herds. Multiple structures provide stalls and shelter. As a non-profit, we rely on donations from the public and our founders for our expenses. We were registered as an Oregon non-profit corporation on April 8, 2013. We have received tax exempt 501(c)(3) status from the Internal Revenue Service retroactive to that date. Thus, all donations made to OHR are tax-deductible to the full extent of the law. The mission of Oregon Horse Rescue is to provide a safe and supportive home for horses and other animals that have been neglected, abandoned, or otherwise mistreated. We rehabilitate horses to the best health possible, and selectively place some rehabilitated horses in new homes that can provide them a safe, supportive, and forever home. We aim to educate the public about the problem of mistreated horses and inform them about solutions to the problem. OHR is committed to serving the needs of the equine community through our programs. We strive to continually evaluate our programs in order to grow and develop with the industry so we can continue helping horses for years to come. BEFORE: Katie Sue, OHR’s first rescue horse, at the time of her intake in 2012. As a result of neglect, she was significantly underweight at a body score of 1. Adoption — Provides short-term resources for at-risk horses including medical care and rehabilitation before being place into a new, forever home. The program is designed to respond to intake requests, evaluate new horses behaviorally and physically, attend to any medical needs and provide rehabilitation, continue training or ground work when possible, market and re-home to eligible, screened homes. AFTER: Katie Sue after her time in OHR programs. 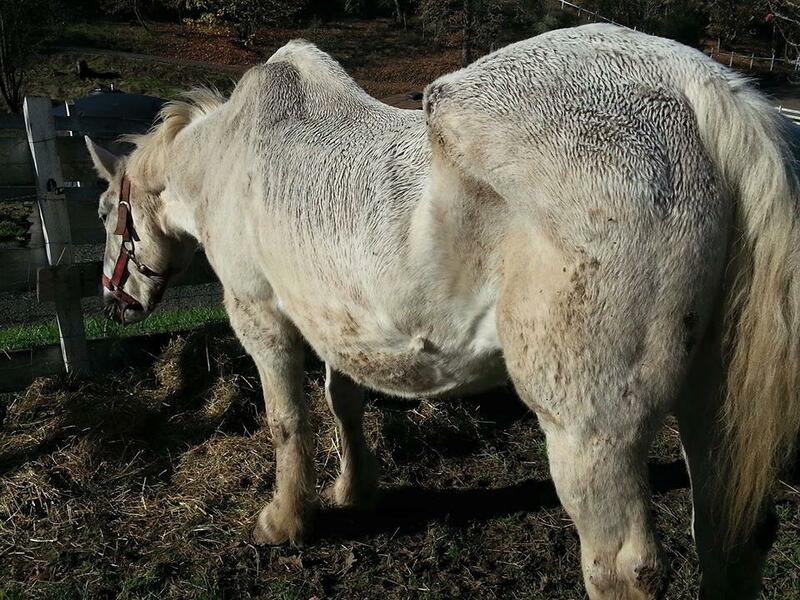 She now has a well-developed top-line and has gained back the weight she lost during her neglect. Sanctuary — Provides long-term care and shelter to non-adoptable horses. The program facilitates OHR to respond to intake requests, evaluate new horses behaviorally and physically, provide medical care and manage dietary needs, integrate horses into the herd dynamic, as well as monitor and manage daily needs. Foster — Matches suitable short-term and long-term foster families with the right OHR horse. Foster horses might need additional or continued training, be a hard-to-place horse, or be a resident horse suitable for companionship. Off-site fostering enables OHR to help more horses at our facility. Volunteer — Provides opportunities for the local community to engage with equine care and rescue work. This program is developing to offer regular, scheduled visits to the OHR facility where trained volunteers can help with barn chores like grooming horses, mending fences, cleaning water buckets, and mucking stalls, among other tasks. Volunteers also help make our fundraisers and events a success. Education — Engages critical audiences through presentations, classes, and accessible resources that focus on equine-specific issues surrounding welfare, care, and management. This program helps us fight the systemic issue of equine abuse, abandonment, and neglect from within, as well as spread awareness about the problems our work addresses.